“This Doepfer has never been on tour, and only used in a non-smoking, personal studio. It’s in amazing shape – only the case cover has been altered with a sharpie, but it’s only cosmetic. Comes with over 20 patchbay cables in various colors and lengths. Thanks for pointing out the power – this is US POWER. The cord is three prong US. 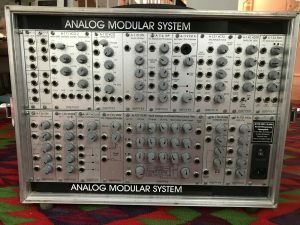 It was converted by a pro modular synth builder in LA – easy conversion. Shipping Included within the 48 states that are connected.